Yes, Donkey Kong 64. It was released in 1999, following 1998's Banjo-Kazooie. From what I gather, both games had pretty long development cycles, were being worked on around the same time. It recently came out on the Wii U VC, providing a way to play the game without enormous slowdowns every 2 seconds. Funnily enough, the game was originally supposed to have an Expansion Pack-less option. A memory overflow glitch that they couldn't solve without the Pack showed up so they cut the Pack-less option and just packaged the Pack with every game. Who knows how the original version would have run. Anyway, DK64 is big. Rare pulled out all the stops, almost achieving the video-game equivalent of SSJ SS. They would have managed it if they only recolored their logo. -201 Golden Bananas, 25 per world, 5 for each Kong. 90 Jiggies? LOL go home kiddo. -Donkey Kong, the big guy. -Diddy Kong, the little guy. -Lanky Kong, the stretchy guy. -Tiny Kong, the little girl. -Chunky Kong, the big guy. Sure, they may have arbitrarily reused the first two niches and added one that never really pays off, but it's still 5 characters. Characters that you will switch between, damn you. Additionally, these characters can supplement their strength further, using Cranky's Alchemy to gain mighty abilities such as HIGH-IMPACT LEVER-PULLING ACTION or HIGH-IMPACT GROUND POUND RECOLOR. You can also buy guns, with the almighty power to open doors, or instruments, with the almighty power to open doors. So, with so much stuff to collect, how do you properly spread it out and keep it interesting? You don't. But this post is long and unfunny enough, so I'll end it there. 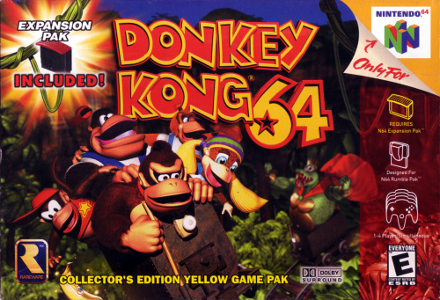 Anyway, for those that have played it, what did you think about DK 64? I never played it but I wanted to badly. Now knowing all ithe item collecting, ugh, no thanks. Is it necessary to collect anything or can you just play through like DKC? You don't need to collect everything, but you do need a chunk of it. There's not much outside of collecting stuff unlike DKC though. It's not nearly as enjoyable as collecting in BK. There's so much stuff that actually getting something doesn't feel rewarding at all, even the harder Gold Bananas. No GB is ever just out there, they're always locked behind a challenge. Unfortunately, many times they decide one challenge is not enough, and thus challenge#1 just leads to a Bonus Stage where you play a mini-game like Slots. As for clever places and thinking outside the box, in this case the box is "all rational thought." For instance, one area has you break igloos by placing boulders on faraway switches. Another has you free a camel by transporting into another area and blasting through barrels. ^^^The levels are less interesting than B-K's, to me, and you have to go through them all at least five times (once with each character) to collect everything. Also there's like a billion more things to collect. DK64 sits in a weird spot for me. I simultaneously despise it and have a huge nostalgic soft spot for it. I sometimes get the urge to play it again, and I have to squash the feeling because I know it will just make me angry. There's 174 coins for DK, 178 for Diddy, 185 for Lanky, 193 for Tiny, and 219 for Chunky, placing the grand total at 949 coins. Though you only need to collect 160 to pay for every upgrade (and the arcade machine). DK64 is B-K's more tedious, less enjoyable younger sister. It's not a terrible game, per se. But you need a ton of patience to make it through to the end. ^ So there's nearly 700 pointless coins? They really thought that out well, I see. As a child, I never played DK 64. I rented it once, but I didn't have the expansion pack so I returned it right away. Thus, DK 64 was that game I always wanted to play, but couldn't. Now that I've reached 101%, I can let go. 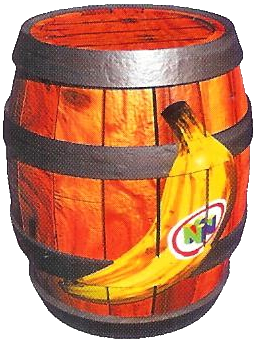 Donkey Kong 64 was made to punish us all. ^It's a challenge for everyone's inner OCD. ^ There are some Gold Bananas that are meant for one Kong but can be gotten with another, leading to level totals that are something like 5/5/6/5/4 instead of 5/5/5/5/5. Pure suffering. I though bananas meant for other Kongs were transparent. Is that because of an oversight or am I just not remembering correctly? Banana Bananas are, but not Gold Bananas IIRC.